Republican Sen. Rand Paul speaks during an event at the University of Chicago on April 22. Rand Paul is having a moment. A recent cover story for The New York Times Magazine dubbed the potential Republican presidential candidate the “Pearl Jam” of the libertarian movement and a force that could win over young voters in 2016. It’s a tantalizing theory for the right and a fun story for the media. But the data suggests that the senator from Kentucky has his work cut out for him. So far, Paul isn’t doing much better among young voters than the Republican nominee in 2012, Mitt Romney, or than Chris Christie, the New Jersey governor, is currently doing. Since the beginning of the year, there have been eight live-interview national polls that detail results among young voters (ages 18 to 29 or 18 to 34), and matched Paul against former Secretary of State Hillary Clinton. Together, these polls give us the views of more than 1,000 young voters. 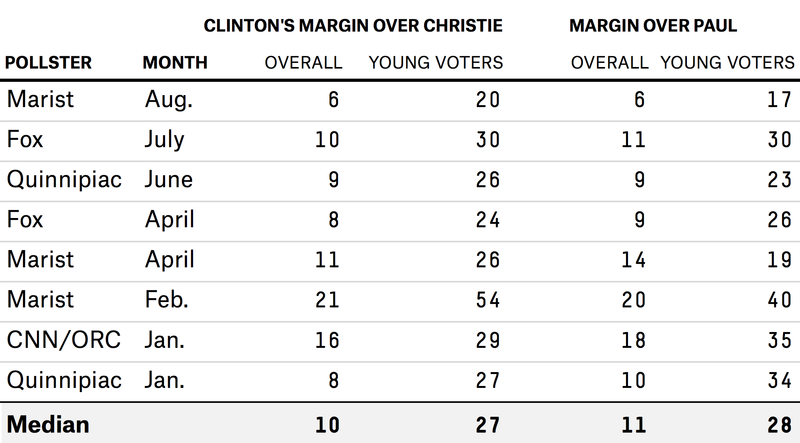 The same polls matched Clinton against Christie. The surveys show that young voters don’t see any difference between Paul and other Republican politicians. Why should we trust these surveys? We shouldn’t expect early polls to tell us the final vote in 2016, but it’s probable that each candidate’s coalitions will remain mostly intact. Both the subsample and the overall margin should shift relatively uniformly. For example, Republicans should do better with white voters than they do overall, even if their margin among both shrinks or widens. The median of the eight surveys shows that among young voters, Paul trails by 17 percentage points more than he trails among all voters. That would represent a slight improvement over Romney, who lost young voters by 20 points more than he did voters overall. Still, Paul’s and Romney’s relative performances with young voters are within the margin of error of each other. 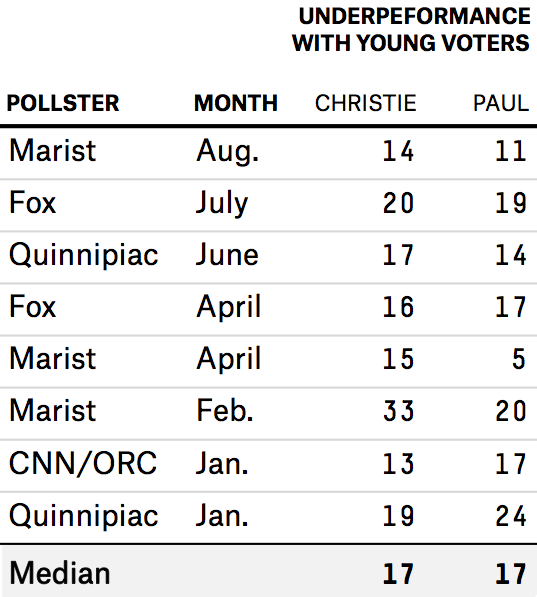 Moreover, the difference between Christie’s margin among young voters and his margin overall is the same as Paul’s: 17 points. The only difference is Christie is doing slightly better among all voters. That suggests the slight improvement over Romney’s performance with young voters — if it isn’t simply noise — isn’t unique to Paul. One could argue that young voters might warm to Paul as they get to know him better; after all, 45 percent of Americans have no opinion of Paul. But it’s not entirely clear Paul’s numbers will drastically improve if young voters learn more about his positions. There are issues on which he is more aligned with young voters than other Republicans are, such as marijuana policy and perhaps the death penalty. But he’s not aligned with those young voters on several issues that Gallup recently found to be the most important: immigration, jobs and the economy, health care and foreign policy. Immigration: Paul is against a path to citizenship for those in the U.S. illegally. According to the Pew Research Center, 55 percent of millennials favor a path to citizenship; just 41 percent support deportation or allowing people to stay as noncitizens (as Paul wants). Millennials are 9 percentage points more likely to back a path to citizenship than all Americans. Jobs and the economy: Paul thinks we need to shrink the government and let the free market solve economic woes. Millennials in the 2012 American National Election Survey said, by a 25-point margin (62.5 percent to 37.5 percent), that a strong government is needed to solve complex problems. That margin is 4 points greater than all adults. Health care: Paul is against government regulation. Pew found that 54 percent of millennials think it’s the government’s responsibility to insure health care for all, and only 44 percent of them are against that. Forty-seven percent of all Americans say it’s the government’s responsibility. Foreign policy: Paul supports less intervention abroad. That aligns with the 76 percent of young voters who want the U.S. to focus on home rather than promote democracy overseas, according to a Quinnipiac University poll. Paul’s problem, though, is that while millennials may not want wars, they don’t want the U.S. to withdraw from the world. Paul wants, for example, to end almost all foreign aid. According to the pooled results from the 2008-12 General Social Survey, young people believe by a 7-point margin (53.5 percent to 46.5 percent) that foreign-aid levels are too little or about right rather than too much. Meanwhile, 61 percent of all Americans say such aid is too much. Paul has also sponsored a bill that would basically withdraw the U.S. from the United Nations. According to Gallup, 76 percent of young voters think the U.N. is necessary. That’s 10 points higher than all Americans. All in all, it’s not clear that Paul’s message has or will resonate with younger voters. Paul may make inroads by 2016, but there are plenty of reasons to be skeptical.